During his career Ralph Carmichael has worked with such names as Nat King Cole, Bing Crisby and Ella Fitzgerald. He also composed the theme music for the TV show "I Love Lucy" and numerous other programmes. In the early 1960s he helped create Light Records/Lexicon Music to promote contemporary Christian music. I have been unable to confirm claims that Carmichael himself recorded "Reach Out To Jesus" in 1968. The Ralph Carmichael organisation only confirms that the song was copyrighted in that year. 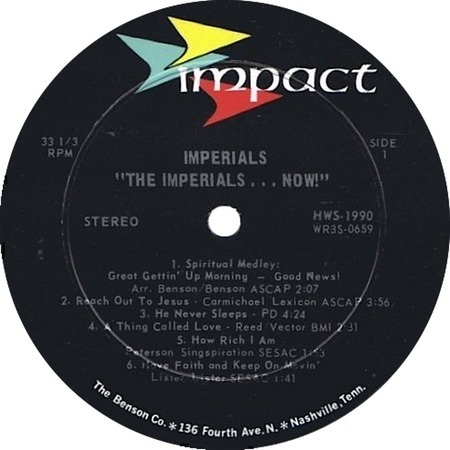 The honour of having recorded the original version of "Reach Out to Jesus" therefore goes to The Imperials, who included it on their 1968 LP, "The Imperials…Now!" released in Impact HWS 1990. The Imperials backed Elvis on his own version of "Reach Out To Jesus."